Hey there! After indulging in tons of amazing meals on vacation, John and I were ready to get back to our normal, lighter fair. Well, we weren't, but our waistbands were - it was worth it! Anyhoo... I saw this recipe on Jourdan's blog a couple weeks ago, and it sounded so flavorful - yet healthy! - that I knew I wanted to try it. It also seemed like the perfect dish to help get us back on track. This recipe was so, so, so good! We loved all the veggies and how everything came together. However...I will tell you that is a recipe I designate as "easy... but time-consuming." Chopping and roasting veggies, layering ingredients and oven-time add up, but it's not actually difficult. So, if you're looking for a fast recipe, this isn't for you. But if you're looking for an easy recipe and don't mind putting in some time, then this is definitely for you. I highly encourage you to spend the time on this, because you won't be disappointed, and you're sure to have perfect (and healthy!) leftovers for lunch all week! *Preheat the oven to 400 degrees. Line a baking sheet with tin foil (for quick and easy clean up) then coat the tin foil lined baking sheet with olive oil cooking spray. *Clean and slice the veggies and layer all but the zucchini and yellow squash on the sheet. Drizzle a bit of olive oil on top, season with sea salt, cracked pepper, basil and oregano to taste. Toss to coat and place in the oven for 20 minutes. 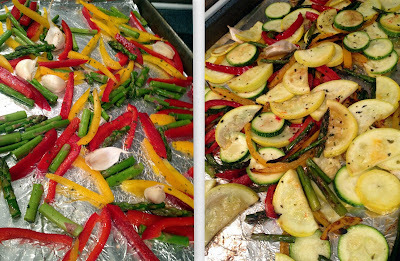 *After 20 minutes, add the zucchini and yellow squash to the roasted veggies, toss and return to the oven for an additional 10 minutes. Remove from the oven and set aside. Once the garlic cloves cool down, carefully peel the skin off and slice. Add sliced garlic back in with the rest of the veggies. 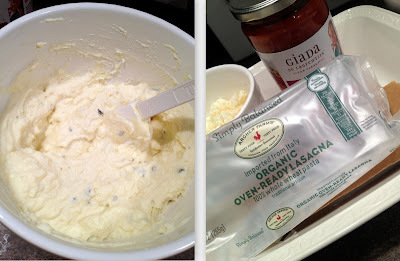 *For the ricotta mixture, combine all the ingredients and mix thoroughly. *Turn down the oven to 350 degrees. Coat a large glass baking dish with olive oil cooking spray. Pour a bit of marinara sauce on the bottom of the dish (I used about 3/4 cup), then place a few lasagna noodles down to completely cover the bottom of pan. Add half of the ricotta mixture and spread evenly over the noodles. *Next add half of the roasted veggie mixture. 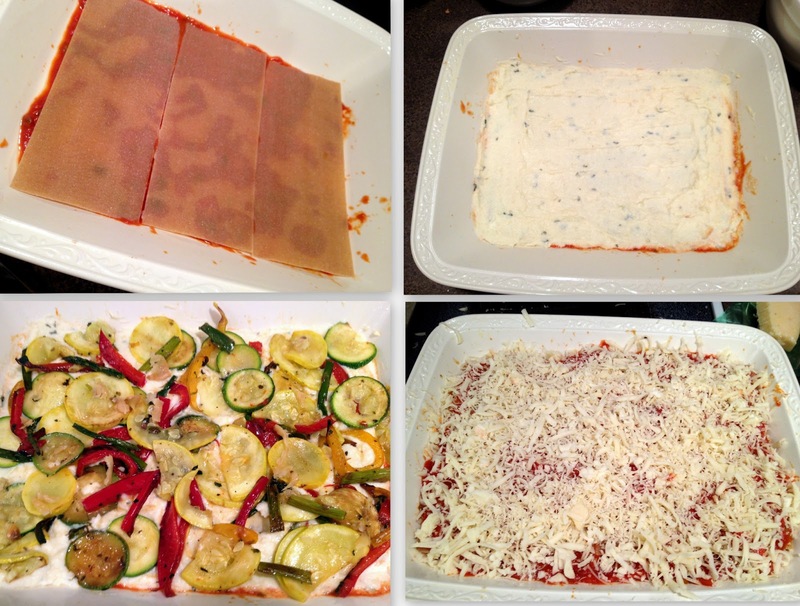 Cover the veggies with lasagna noodles then sauce. Add the last of the ricotta mixture then the remaining veggies. Cover with lasagna noodles, more sauce then sprinkle the top with mozzarella, Parmesan and dried basil. *Bake covered for 30 minutes; remove the cover and bake for an additional 5 minutes or until the cheese is melted and golden brown. Cool for at least 5 minutes before slicing. Enjoy!